The Novy team at Chevys! 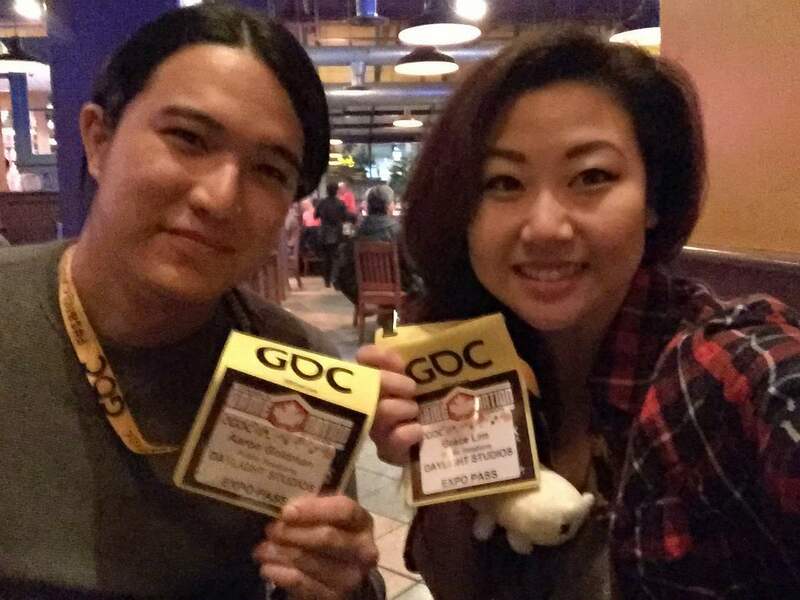 Aaron and Grace after picking up their GDC badges . . . for the first time. 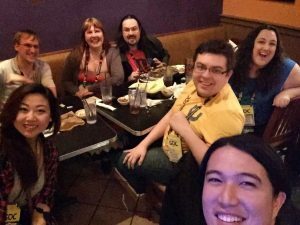 “GDC 2015 was a unique experience for me. This was the first time I had been to California, and I was incredibly excited about visiting the West Coast. I live in Atlanta, so I was a bit nervous if I was going to discover that I was secretly a redneck in denial. Thankfully, that did not happen — but GDC still felt like stepping into another world . . . a gloriously wonderful world. I had attended conferences before, like PAX East in Boston, but this was the first time I had been to GDC. This was also the first conference I had attended as a PR professional and not a journalist, so it was interesting being on the other side of the table. We were at GDC to represent Daylight Studios (Holy Potatoes! A Weapon Shop?!) and assist them with their booth. Working with such a unique game raised many eyebrows and brought an interesting set of challenges. 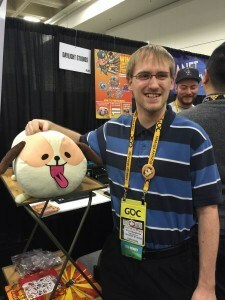 We were constantly packed with people, and everyone wanted to take pictures with our giant potato dog plushie. People loved that potato dog so much so that I even had to save it from being dog-napped. (I’m not exaggerating.) During the craziness, I discovered that I can hold a conversation with up to 20 people simultaneously; it’s quite impressive, actually. Blane guarding the infamous potato dog at the Daylight Studios/HPAWS booth. “Every GDC I have attended has been more wonderful (and busy) than the last (thanks in no small part to the Herculean efforts of Meggan Scavio, the general manager of the event). I had a hunch that this year, my fifth making the trek into my favorite city for the conference, would be special. I wasn’t wrong. 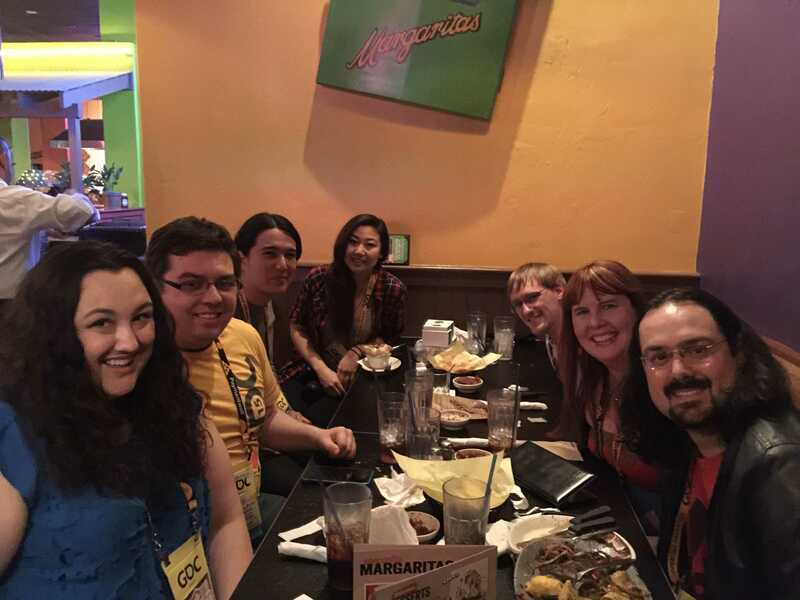 The item that dominated my itinerary was the IGDA Foundation Intel Scholars program. I had the incredible honor of being program leader for this fantastic project, which was born of Intel’s recently announced diversity initiative. Twenty-nine talented women students received scholarships to attend GDC as part of this effort, and it was my job to make sure they got the most out of it. Luckily, I had the help of three amazing volunteers who generously gave their time to making sure everything ran smoothly: Sela Davis, Renee Nejo, and Andi Schmoll. I also attended GDC in my capacity as chair for the IGDA’s Women in Games Special Interest Group (WIG SIG). We were proud to organize a session on how to advocate for diversity from within your company — presented by my brilliant co-chair, Anne Toole. It was an eye-opening workshop that featured actionable advice from Kate Edwards, Sheri Graner Ray, Manveer Heir, and Tim Borrelli. We also held our annual roundtable, where we presented on our activities from the past year, swapped stories, and brainstormed on what to do in the year to come with close to 50 conference attendees. Highlights from our efforts in the past year included helping bring the IGDA Developer Satisfaction Survey to life (spearheaded by steering committee member, Celia Pearce), the launch of a series of monthly interviews featuring women in game development at all levels of their careers (run by Anne Toole), an education series designed to help women gain the confidence to apply to present more often at industry conferences (also run by Anne), and the development of the IGDA’s online harassment resource center. There was also our annual networking social, a small gathering that brings industry women together in a casual and safe environment. 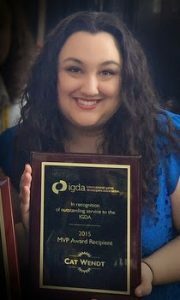 I was surprised and honored to receive an MVP award from the IGDA for my work on the online harassment resource center, the IGDA newsletter (of which I was art director for nearly five years), and various other volunteer contributions I’ve made to the organization since I joined in 2008. Cat with her well-deserved IGDA MVP award.